At Hopetoun we recognise the significant responsibility, influence and opportunities we have to affect the wildlife, natural resources and landscape across a large area of West Lothian. This summer the Estate began to implement a challenging, exciting and highly significant programme of environmental protection and enhancement work under the Agri-Environmental Climate Scheme (AECS). AECS, part of the Scottish Rural Development Programme, promotes land management practices which protect and enhance Scotland’s magnificent natural heritage, improve water quality, manage flood risk and mitigate and adapt to climate change. It is being implemented at Hopetoun Farm and will see 20% of the Estate’s farmland actively managed under environmental measures including pond creation, development of arable grass margins and waterside margins plus new wildflower meadows and wetlands over the next 5 years. Work commenced in August with the creation of the first of 30 new ponds on the Estate. The ponds are designed to provide suitable breeding sites for Great Crested Newt, a European Protected Species (EPS). Although the Estate is only a few kilometres from two known breeding areas there are no known breeding ponds at Hopetoun. The new ponds will create ‘stepping-stones’ across the farmland where each pond will be no more than 500m from another to facilitate potential colonisation by great crested newts. 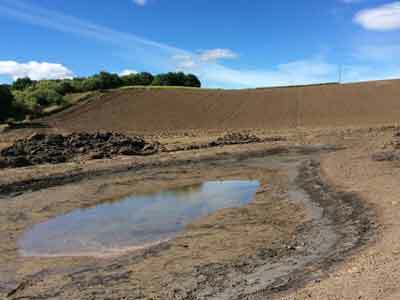 The ponds will also increase the productivity of surrounding arable farmland by improving drainage. The ponds are also linked by a network of grass margins, wildflower grassland and wetlands. 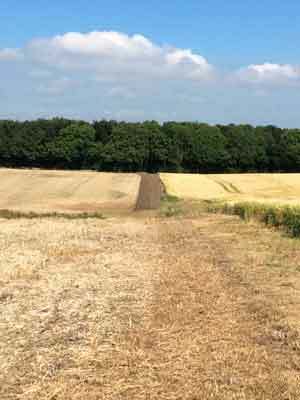 Grass margins were already in place at the farm but the scheme sees their implementation more than doubled to 80km and their width increased to at least 4m. The margins feature dense vegetation providing the perfect habitat for great crested newt and other amphibians to find refuge, food and hibernation. The margins are also the perfect habitat for field vole, the primary prey for barn owl, and an ideal habitat for ground beetles, hoverflies, ladybirds and other predators of aphids whose population pose a threat to arable crops. The autumn will see the completion of the pond digging and preparation of the new grass margins, wildflower meadows and wetlands in some of the Estate’s less productive arable areas. The meadows will include a variety of wildflowers to create a vital pollen and nectar source. The wetlands will provide a rich source of insects. Together these will provide a rich source of food for birds including yellow hammer, grey partridge, lapwing and curlew as well as for frogs, toads, bats and newts. The Estate also has plans to work in partnership with local schools from the Lothian region so that they may actively participate in the scheme linking with curricular themes such as science, history, environmental studies, rural studies, art and geology. As the scheme evolves regular updates, interesting facts and discoveries will soon be available online by searching the hashtag #HopetounFarm. If you’d like more information on Hopetoun’s AECS contact Mike Eagers, Head of Rural Land Use at Hopetoun Estate on 0131 3319940.